“After working in sales and customer service jobs for most of my life I finally decided it was time for a change. So I decided to learn how to code on my own, focusing mainly on web development. I went through the basics just fine but started hitting some roadblocks on the more complicated stuff. I quickly realized that these roadblocks will take a lot time and patience to persevere through. Getting stuck in programming can certainly be frustrating but definitely part of the learning experience. It can also drain your energy to continue to move forward, especially when you’re doing it by yourself. A couple months go by, and I started to consider getting professional instruction. 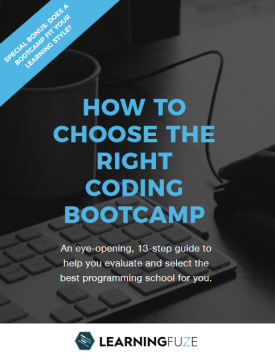 Yes, it can get expensive, but with the right kind of professional instruction and mentorship, you get invaluable guidance, motivation, tricks-of-the-trade, and the discipline that really makes all the difference in learning how to code. Would Bruce Lee be as great of a martial artist as he was without the instruction of Ip-Man to start his journey of mastery? Enter, LearningFuze! The instructors here are of first-class quality. Thi (day time full immersion instructor) is an absolute wizard with code and has over 10 years of experience. You’ll be amazed at what this guy can do with a computer and a keyboard. Daniel (day time full immersion instructor) has been coding before the days of Google, is extremely knowledgeable on many different languages and platforms, and he’ll take the time to sit beside you to pair program your way out of complex problems. Binh (part-time night instructor) has over 7 years of full-stack development experience and is very passionate about teaching. She cares deeply about whether you learn or not. For example, during one evening session my class mates all either got sick or had emergencies, so I was the only one that could make it. Instead of cancelling class, she stayed and tutored me one-on-one through some of complexities of Object-Oriented programming. This is the level of commitment you get from your instructors at LF. They can only do so much though, the rest is up to how hard you work, how many hours you put in, and whether you can summon up the emotional intelligence and maturity to deal with frustrations that naturally come with learning how to code . I can personally attest though, that the harder you work the easier it gets! The commitment doesn’t stop with the instructors though, Bill and Fabian (Director of Operations, Director of Technology, respectively) work their butts off to work with employers and connect them with the students. There are speaking events once a week, sometimes more. During those events, they often provide food, snacks, and beer! In fact, Fabian and I have sat down over a couple of beers to discuss the current landscape of higher education and where he believes technology and full-immersion bootcamps like LearningFuze will serve a role. Currently, almost all of the students in my cohort (2nd cohort) have jobs or job offers they’re weighing. 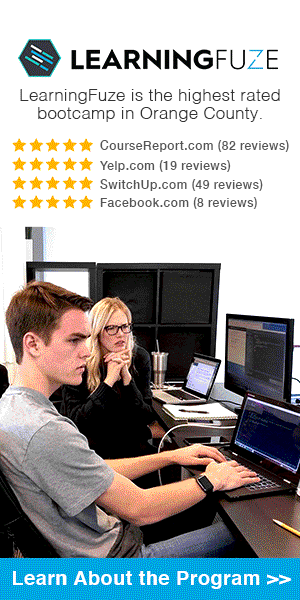 I myself got hired on to a web development agency only a few weeks after graduation. Not saying that it’s a walk in the park though, we’re competing with college grads with 4 year CS degrees, but web development is a hot field right now, work hard, put up some quality projects on GitHub, network, and you’ll be on your way to a better career and life. This is a welcomed payoff for the risk that I took in pursuing this field. I don’t have a lot of money. I thought long and hard before asking my uncle to borrow the funds to pay for tuition. So I was extremely motivated and definitely not looking to waste any time and/or money. You can ask Bill, I gave him a hard time about all the details of the program to make sure I was getting the most of my money before I signed on. On the surface, you might think you’re mainly paying for the instruction (which is extremely important and valuable alone), and maybe some space to learn with some complimentary snacks. There is however, something much more valuable that you’re paying for, something priceless and hard, if not impossible to achieve by yourself: Access. Obviously, you get access to great quality professional instruction, but you also get access to a group of students just as motivated as you to better their lives in a new career-field. When a group of people are committed to a common goal, have a serious financial stake in performing, and are put together in the same room, you get an amazing camaraderie, and collaboration towards ideas and learning. What else do you get access to? How about the network of CTO’s, hiring managers, developers, and recruiters from local companies that are looking to hire, mentor, and guide you? During the speaking events, you get direct access to these people, and you get invaluable tips and inside information about the industry. You just don’t get this level of access by just calling companies and asking to talk to the CTO or Senior Developers. Thank you Vick and enjoy your journey as a PROFESSIONAL developer!